Caldecott Honor winner Steve Jenkins is back with more Extreme Animals, perfect for young readers looking for accessible nonfiction chock full of incredible art. 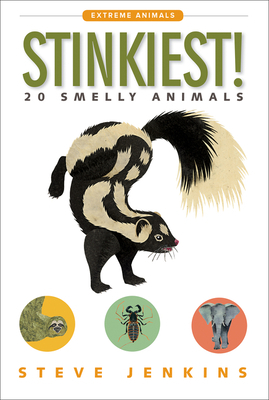 Stinkiest! will focus on the smelliest members of the animal kingdom. Through illustrations, infographics, facts, and figures, readers will see how big each animal is compared to humans, where it lives on the globe, and just how putrid it can be! With his signature art style, Steve Jenkins' Extreme Animals reader series explores nature's truly superlative animals. These readers are fact-packed and span the globe, detailing the astounding abilities of every shape, size, and species. Each installment focuses on amazing and unusual animals, making these nonfiction readers accessible, informative, and fascinating.